Manchester City coach Mikel Arteta says he’s ‘so happy’ where he is after missing out on the Arsenal job this summer. For a long time the Spaniard, who played for the Gunners between 2011 and 2016 and even captained the club for some of that time, looked the big favourite to come in and replace Arsene Wenger after he finally called time on 22 years in north London. In the end, however, Unai Emery came in for Arsenal, in a somewhat surprise turnaround late on, leaving Arteta to remain part of Pep Guardiola’s coaching staff at the Etihad Stadium. 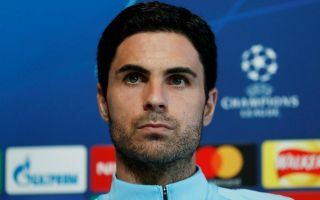 Arteta remains highly regarded in the coaching business and has admitted himself he still harbours dreams of becoming a head coach himself at some point in the future. Some Arsenal fans will no doubt hope this means he could be a contender for them at some point again, perhaps when he builds up more experience. Either way, it seems the former midfielder is dead set on moving on to a bigger role for himself at some point, but for now is perfectly happy to continue his development at City. ARTETA: First of all, i am privileged to be here and I am very fulfilled. But if you ask me one day will I be a head coach, the answer is probably yes. But we have fantastic momentum and there is lots of room for this Club to grow. ARTETA: Pep had a very clear role for me when he asked me to join the club. I had played in the Premier League for years. My learning here has been incredible. That will continue. The decision to stay (in the summer) was made and I am so happy. Arteta was speaking at a press conference, filling in for Guardiola, and was quoted on the club’s official Twitter feed as saying: ‘My learning here has been incredible. That will continue.